In the paper making art, an aqueous suspension containing cellulosic fibres, fillers and additives, referred to as stock, is fed into a headbox which ejects the stock onto a forming wire. Water is drained from the stock through the forming wire, so that a wet web of paper is formed and dewatered on the wire. The paper web is then dried in the drying section of the paper machine. Drainage and retention aids are conventionally introduced into the stock in order to facilitate drainage and to increase adsorption of fine particles onto the cellulosic fibres to retain them with the fibres on the wire. Akzo Nobel N.V. (Arnhem, NL) inventors Johan Nyander, Hans Johansson-Vestin, Jan Nordin and Annika Viola Pal unexpectedly found that an improved drainage and/or retention effect of a cellulosic suspension on a wire can be obtained by using an aqueous silica-containing composition comprising anionic naphthalene sulphonate formaldehyde condensate and nano silica-based particles. The nanoparticles make it possible to increase the speed of the paper machine and to use a lower dosage of additives to give a corresponding drainage and/or retention effect, thereby leading to an improved papermaking process and economic benefits, according to U.S. Patent 7,608,644. The aqueous silica-containing composition can also be used as a flocculation agent in the treatment of water for the production of drinking water or as an environmental treatment of waters for instance in lakes. The composition can also be used as flocculation agent in the treatment of waste water or waste sludges. Examples of suitable silica-based particles include colloidal silica, colloidal aluminium-modified silica or aluminium silicate, and different types of polysilicic acid and mixtures thereof, either alone or in combination with other types of anionic silica-based particles. General Atomics Electromagnetic Systems division (GA-EMS) successfully fired multiple rounds for the first time in a prototype of its new Blitzer electromagnetic railgun air defense prototype system. GA-EMS adds Blitzer will provide transformational, leap-ahead air defense capability against a number of threats for both naval and land-based applications. 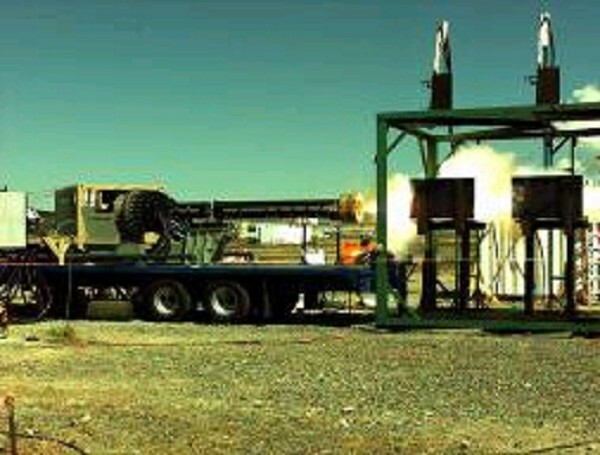 These tests were performed at the US Army Dugway Proving Grounds under a contract with the Office of Naval Research. Testing is scheduled to continue through to the second quarter of next year and will culminate with the launch of tactically relevant aerodynamic rounds, GA-EMS says in a statement. With a muzzle velocity of more than twice that of conventional systems, Blitzer provides significant increases in standoff and lethality at lower cost without the need for propellant or high explosives. "These tests are an important first step toward demonstrating the viability of a revolutionary technology that will significantly improve the safety and protection of our warfighters at sea and on land," says GA-EMS Division Vice President R. Scott Forney III. Last year, the U.S. Navy tested a railgun which at full capability will be able to fire a projectile more than 200 nautical miles at a muzzle velocity of mach seven and impacting its target at mach five. In contrast, the current Navy gun, MK 45 five-inch gun, has a range of about 13 miles. The high velocity projectile will destroy its targets due to its kinetic energy rather than with conventional explosives. The U.S. Navy would be able to launch shells into space and still hit within 5 meters of the target. Railgun technology uses high-power electromagnetic energy instead of explosive chemical propellants (energetics) to propel a projectile farther and faster than any preceding gun. 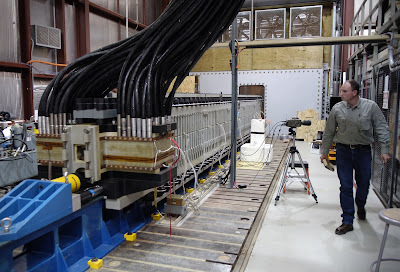 The Navy’s Office of Naval Research (ONR) successfully conducted a record-setting firing of an electromagnetic railgun at Naval Surface Warfare Center, Dahlgren, VA. An invited audience, including the Chief of Naval Operations, ADM Gary Roughead, witnessed this revolutionary technology in action. ONR’s EMRG Program is part of the Department of the Navy’s Science and Technology investments, focused on developing new technologies to support Navy and Marine Corps war fighting needs. The total budget for ONR’s Innovative Naval Prototype railgun program currently is $237 million from FY 06-FY-11. What types of targets can the EMRG be deployed against? Currently, plans call for developing three different rounds for the EMRG: a unitary round for engaging “hard” targets such as prepared positions, bunkers, and buildings; a rod-dispensing round for vehicle targets; and a pellet-dispensing round for personnel targets. Photo shows the power for 10 megajoules railgun shot. Charles Stark Draper Lab, Inc. 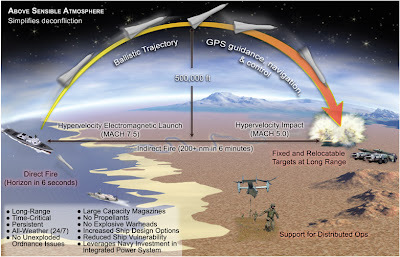 The planned timeframe of having a deployable weapon system is by 2020-2025 with a working prototype around 2016-2017. The Navy is working on understanding railgun system impacts for ships of different sizes. Integration could occur on new vessels or by retrofitting on existing platforms. The most important developments that will take place during the lifetime of the railgun Innovative Naval Prototype program fall into four key categories: the materials that will comprise the bore and containment system of the launcher; the projectiles; the pulsed-power network; and ship integration. The projectile will have a guidance system and travel at 7500 mph when launched. Compare with SR-71 (mach 3.5 maximum -- 2,500 mph) and launch of the Space Shuttle (two minutes into the ascent, the space shuttle is about 45 kilometers [28 miles] above the earth's surface and is traveling nearly 5000 kilometers per hour [3,000 mph]). Without any kind of warhead, how will a non-explosive projectile cause any real damage? With an impact speed of Mach 5, a projectile will use kinetic energy alone to destroy a target. In essence, damage is caused by the thousands of fragments -- each one of them traveling at lethal velocities -- created by the impact of each projectile. The ONR website has video of a demonstration of a prototype capable of delivering a 10 megajoules (a measurement of energy) shot. Evonik aims to be Europe’s no. 1 manufacturer of large-format lithium-ion battery cells and components. We already play a leading role in this key technology, which is poised to open up a wide range of new applications: cordless power tools and home appliances, the storage of wind energy and solar power and, above all, resource-saving hybrid and electric vehicles. Double-digit growth rates make automotive applications the largest and most attractive market in this field. Experts predict that the market for high-performance lithium-ion battery materials will exceed €4 billion within the next decade and that demand for batteries could top €10 billion in the same timeframe. 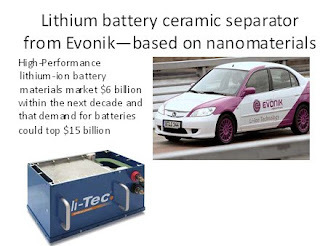 Evonik’s ceramic-coated nano-membrane battery separator is an innovative breakthrough. Evonik positioned itself early on in the growing market for lithium-ion battery components and is now one of the technology leaders. Building on its expertise in specialty chemicals, in recent years we have invested specifically in the development and commercialization of lithium-ion battery materials, together with construction of the necessary production facilities. Compared to conventional battery systems that use lead or nickel, lithium-ion batteries are smaller, lighter, more powerful, and lose very little energy when not used for prolonged periods. Lithium, an alkali metal, is extremely suitable for rechargeable batteries as it is the lightest metal and produces the highest voltage in the cell. Electric drives with these high-performance batteries are now nearing mass market readiness. Experts estimate that zero-emission fully-electric vehicles could gain 10 percent of the European market over the next ten years. Energy, electronics and automotive companies are currently building the necessary infrastructure and defining uniform standards, for example, for plugs and charging stations for electric vehicles. Since May 2009 Evonik has been involved in the cross-sector initiative ELAN 2020, which was established to promote electro-mobility. Its work includes investigating the requirements for a safe, economical and widespread infrastructure for electric vehicles. The strategic alliance in the field of lithium-ion batteries concluded by Evonik and Daimler AG on December 15, 2008 is a milestone on the road to establishing electric vehicles. Based on Evonik’s technology and Daimler’s expertise, the two companies are driving forward joint research, development and production of lithium-ion battery cells and systems for the automotive industry. In recent years Evonik has invested around €80 million in the development of technology for serial production of cells for large-format lithium-ion batteries. Süd-Chemie AG, Munich and Evonik Industries AG, Essen have agreed to enter into a supply partnership aimed at using novel materials in the next generation of lithium-ion batteries for automobiles and other industrial applications. By entering into this agreement, both enterprises have laid the foundation for the preferred delivery by Süd-Chemie to Evonik of the high performance energy storage material of the future, lithium iron phosphate (LiFePO4, also referred to as LFP), to be used in rechargeable lithium-ion batteries. The use of lithium iron phosphate in lithium-ion batteries will significantly improve the conditions for a swift and wide-scale introduction of more powerful electric drives for the next generation of hybrid and electric-drive vehicles. Süd-Chemie will be responsible for manufacturing the high-grade lithium iron phosphate in line with the required specifications, and for technical customer service. With the aid of the cathode material lithium iron phosphate, Evonik intends to develop to market maturity high-powered cell components for both mobile and stationary applications via its subsidiary Evonik Litarion GmbH, focusing initially on the European market. The main features of lithium iron phosphate which make it especially suitable for use in lithium-ion batteries are its high energy density, its high cycle stability, long life and above all, the intrinsic safety of the material. High-end steel sheets have come to be used extensively in automobile. Recently, in order to further reduce weight and improve crashworthiness, demand has risen for higher strength steel. JFE Holdings successfully developed a new higher strength steel with excellent stretch flange formability using nanometer-sized carbides that are ten times finer than those of conventional steels. This steel, named "NANO HITEN™," is the first high strength automotive steel to use nanotechnology. The main technique in the manufacturing process for the new steel is the combining of the ferrite matrix and the fine carbides. Generally, fine carbides coarsen easily in a ferrite matrix. JFE successfully achieved fine carbide retention in a ferrite matrix during the manufacturing process. The new technique has made it possible to exhibit both high strength and excellent formability. "NANO HITEN™ has won many prizes, and in March 2008 received Japan's 21st Century Encouragement of Innovation Prize, a national commendation. 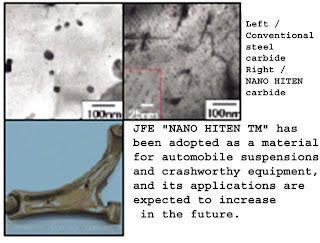 "NANO HITEN™ has been adopted as a material for automobile suspensions and crashworthy equipment, and its applications are expected to increase in the future. 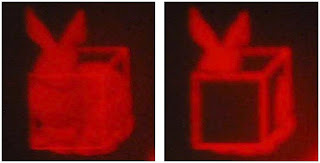 Ferroelectric liquid-crystal-over-silicon (LCOS) microdisplays have been used to project simple 3D images. Conducting MWCNTs can be used to build 3D electrode structures in optically anisotropic media such as liquid crystals, making novel new micro-optical components possible, according to Tim Wilkinson, University of Cambridge (Cambridge, United Kingdom). The discovery opens up reconfigurable holography to a new realm of applications which use partially coherent light sources such as LEDs. Wilkinson hopes to expand on recent success to build a viable display system for true 3D holographic images. A complete report on the use holographic display using carbon nanotubes can be found in the SPIE newsroom. Both the International Standards Organization (ISO) and Organization for Economic Co-operation and Development (OECD) subdivide nanomaterials into “nano-objects” and “nano-structured materials.” According to ISO TS 27687, nano-objects include nanoplates, nanofibers and nanoparticles, and are nano-scale at least in their exterior measure ments—in other words, they measure between one and 100 nanometers in length, width or height. Another ISO working group is currently working on the hierarchy and definitions of nanostructured materials, which include materials with a nanoscale structure within the material or on its surface. Prominent examples are nanocomposites, agglomerates and larger aggregates. These kinds of aggregates and agglomerates are composed of primary particles (< 100 nm), which occur at an intermediate stage during the manufacturing process and react with each other under the relevant process conditions to form larger stable aggregates. In these aggregates, the primary particles are firmly connected by a chemical bond. For their part, the aggregates form micrometer-size agglomerates as a result of van der Waals forces. 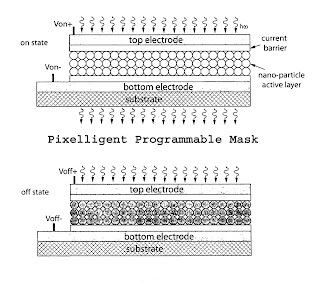 Pixelligent Technologies LLC (College Park, MD) reveals programmable photolithographic masks based on semiconductor nano-particle optical modulators in U.S. Patent 7,605,390. Nano-particles provided with control circuitry are used to form the programmable masks. The optical characteristics of the nano-particles can change to provide patterned light. Such patterned light can be used to expose a photoresist on a semiconductor wafer for photolithography, according to inventors Zhiyun Chen, Gregory D Cooper, Serpil Gonen and Erin F. Flee. The following figure illustrates the on and off states for Pixelligent's programmable mask. Generally speaking, optical modulators are devices, which can modify the intensity and/or phase of light passing through them. Applying an electrical voltage modulates most optical modulators. Modern optical modulators have a wide range of applications such as optical communication, displays, metrology, detection, and lithography. Many modern optical modulators, such as Fabry-Perot optical modulators and Bragg optical modulators are made from semiconductor thin film hetero-structures. The process for operating an electrically modulated programmable mask for optical lithography includes the following steps: (1) Illuminating, with a light of one of the lithographic wavelengths of 248 nm, 193 nm or 157 nm, a sapphire substrate containing electrical control circuitry, and further having at least a thin layer of semiconductor nano-particles with a bandgap disposed on a portion of the substrate. The bandgap corresponds to the energy of the individual wavelength. (2) By applying a voltage or current to the nano-particles in the thin layer it is possible to change transparency thereby controllably absorbing or transmitting light at the lithographic wavelengths of 248 nm, 193 nm or 157 nm. The nano-particles provide optical modulation at each wavelength; and can expose a semiconductor wafer with a spatial light pattern responsive to the applied voltage or current. Pixelligent inventors Zhiyun Chen, Gregory Cooper, Serpil Gonen and Erin Flee realized that it would be especially useful to fabricate an array of optical modulators based on semiconductor nano-sized particles for use in photolithography and other applications. Programmable photomasks made from arrays of nano-particle based optical modulators include control circuitry to control each modulator. In such an array, the active parts of the modulators can be formed by nano-sized semiconductor particles, which may be organized in a variety of ways, including colloidal, compressed solid, or quasi-crystals. In such modulators, the intensity and/or phase of light transmit through or reflected by them can be controlled by applying an electrical field to these modulators. Fuel cells are often promoted as way to decrease society's dependence on fossil fuels. But there is still much work to be done before fuel cells will be ready for mass market use in transportation, home heating and portable power for emergencies. University of Calgary chemists Jeff Hurd and George Shimizu have discovered a new metal-organic solids that allow a polymer electrolyte membrane (PEM) fuel cell to work at a higher temperature. This discovery is extremely important in terms of increasing the efficiency and durability as well as decreasing the cost of PEM fuel cells. "This research will alter the way researchers have to this point perceived candidate materials for fuel cell applications," says Shimizu a professor in the Department of Chemistry at the University of Calgary. A research paper by Shimizu, Hurd, Ramanathan Vaidhyanathan and Venkataraman Thangadurai of the University of Calgary, and Christopher Ratcliffe and Igor Moudrakovski of the Steacie Institute for Molecular Sciences, National Research Council, has just been published in Nature Chemistry online. Shimizu filed U.S. Patent Application 20080160356 with the US patent office last year. A fuel cell is an electrochemical energy conversion device which converts the chemicals hydrogen and oxygen into water and electrical energy. Water usually carries the ions (protons) in a hydrogen fuel cell but this research uses higher boiling molecules trapped in a molecular scaffolding. Currently, PEM fuel cells can produce energy from hydrogen below 90 °C, just under the boiling point of water. With Shimizu's material, energy can be produced at a higher temperature, up to 150 °C. This could ultimately make the fuel cell cheaper to produce because at a higher temperature less expensive metals can be used to convert hydrogen into energy. Currently, platinum is used which is extremely expensive. Also, reactions at a higher temperature would be faster thus increasing efficiency. "Ours is an entirely new approach that strikes a balance between having a regular molecular structure and mobile components all while showing genuine promise of application," says co-author Hurd, a PhD candidate studying chemistry at the U of C.
Kevin Colbow, director of research and development at Ballard Power Systems, a company that designs and manufactures clean energy hydrogen fuel cells, calls the work significant. "We believe that further improvement on conductivity and robustness of these materials could provide next generation membranes for PEM fuel cells." Figure: This is a magnification of E. coli exposed to a low concentration (10 mg/L) of titanium dioxide nanoparticles. Cells with compromised membranes are stained red. The Skin Deep Environmental Working Group is tracking more than 2750 personal care products that contain either nano-titanium dioxide or nano zinc oxide in their Cosmetic Safety Database including moisturizers, eye liners, lip sticks, make-up foundations, soaps, sunscreens, mascara, nail polish. NANO TITANIUM DIOXIDE is found in 2,146 products and NANO ZINC OXIDE (20-60nm) is found in 666 products. Although research has just begun into the safety of many nano-materials, some research suggest that nano titanium dioxide and nano zinc oxide could be carcinogenic and affect the reproductive system. Nanometer is abbreviated as nm and is 1/billionth of a meter, about 100,000 times smaller than the width of a human hair. Nano Titanium Dioxide has reported used in the following product types: sunscreen: makeup (674); foundation (643); sunscreen: SPF 15-30 (384); facial moisturizer/treatment (339); sunscreen: moisturizer (193); anti-aging (192); lipstick (147); concealer (118); facial powder (98); sunscreen: SPF greater than 30 (95). The Skin Deep working group rates with safety of products on a scale of 1-10 Nano titanium products scores range from 2 (low hazard) to 10 very high hazard. The links will show specific products using these nano materials, which are used by many major manufacturers of cosmetics such as Maybelline, L’Oreal and Aveeno just to name a few. Given the incomplete information made available by companies and the government, EWG provides additional information on personal care product ingredients from the published scientific literature. The chart below indicates that research studies have found that exposure to this ingredient -- not the products containing it -- caused the indicated health effect(s) in the studies reviewed by Skin Deep researchers. Actual health risks, if any, will vary based on the level of exposure to the ingredient and individual susceptibility -- information not available in Skin Deep. Nano Zinc Oxide (20-60nm): Nano zinc oxide offers greater sun protection than larger zinc particles. Comparatively little is known regarding potential health effects of nanoparticles. They do not penetrate healthy skin, and thus appear to pose a low health risk in lotions. Inhalation of powders and sprays is a concern. Nano Zinc Oxide is rated from 3 (moderate hazard) to 10 (high hazard) Nano Zinc Oxide (20-60nm) has reported used in the following product types: sunscreen: makeup (210); sunscreen: SPF 15-30 (208); foundation (205); facial moisturizer/treatment (129); sunscreen: SPF greater than 30 (111); sunscreen: moisturizer (71); anti-aging (55); concealer (26); baby sunscreen (23); sunscreen: lip balm (22). Environmental Canada Domestic Substance List includes suspected effects on the reproductive system by nano zinc oxide and it is classified as expected to be toxic or harmful and as a possible carcinogen. Association of Occupational and Environmental Clinics found strong evidence that nano zinc affects the human immune system and is a respiratory toxicant. The California EPA, Office of Environmental Health Hazard Assessment found limited evidence of immune system toxicity. Nano zinc oxide is also persistent or bioaccumulative in the environment and is of moderate to high toxicity concern in humans Environmental Canada Domestic Substance List Persistent also includes nano zinc oxide as bioaccumulative in wildlife. Using aquatic microbes as their "canary-in-a-cage," scientists from Ohio reported at the 237th National Meeting of the American Chemical Society that nanoparticles now being added to cosmetics, sunscreens, and hundreds of other personal care products may be harmful to the environment. The study by Cyndee Gruden, Ph.D. and Olga Mileyeva-Biebesheimer focused on nano-titanium dioxide (nano-TiO2) particles found in cosmetics, sunscreens, and other personal care products. The particles are added to those products for their highly beneficial effects in blocking ultraviolet light in sunlight. Excess exposure can cause premature aging of the skin and skin cancer. Gruden, who is with the University of Toledo, explained that the particles are washed down the drain in homes as people bathe and end up in municipal sewage treatment plants. From there, they can enter lakes, rivers, and other water sources where microorganisms serve essential roles in maintaining a healthy environment. "When they enter a lake, what happens?" Gruden asked. "Would they enter an organism or bind to it? Maybe they kill it — or have nothing to do with it at all. These are important questions for determining the effects that nanoparticles may have on the environment. Right now, we're not really sure of the answers." 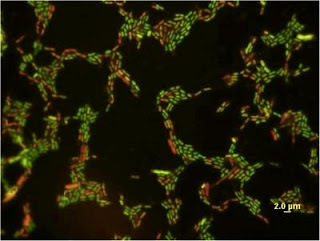 Gruden studied survival of Escherichia coli (E. coli) bacteria when exposed in laboratory cultures to various amounts of nano-TiO2. She found surprisingly large reductions in survival in samples exposed to small concentrations of the nanoparticles for less than an hour. "How fast the impact was surprised me," she said. The findings open the door to future research, including studies to determine whether the same effects occur in the natural environment. Gruden's method for pinpointing damage from nanoparticles uses fluorescence to identify when the cell membrane in microbes undergo damage. When membranes — a crucial part of the microbe — are damaged, the cells emit a faint red glow. "Methods based upon fluorescence allow us to obtain results faster, maybe with greater sensitivity," she said, adding that this approach could speed scientific efforts to understand the threshold at which nanoparticles become toxic to microbes. In a second study on nanotoxicity at the ACS National Meeting, scientists from Utah described development of a new biosensor that flashes like a beacon upon detecting nanoparticles in the environment. Anne Anderson and colleagues at Utah State University and the University of Utah have inserted genes into a strain of Pseudomonas putida (P. putida) — a beneficial soil microbe — so that it emits light upon contact with nanoparticles of heavy metals. They are with Utah State University. The bacteria glow brightly when it is in its normal healthy state. The glow dims upon exposure to toxic substances. "The novelty of the biosensor is we're able to get responses very, very quickly," she said, "and we can get those answers in the absence of other factors that could bind the challenging compounds." Anderson noted that traditional approaches in measuring bacterial cell growth may take two days. "At the snap of your finger you can see some of these things take place." Anderson's group discovered that P. putida cannot tolerate silver, copper oxide and zinc oxide nanoparticles. Toxicity occurred at levels as low as micrograms per liter. That's equivalent to two or three drops of water in an Olympic-sized swimming pool. Anderson warns it could spell danger for aquatic life. "If you look up the Environmental Protection Agency's risk level of Copper to fish and other aquatic organisms, you are at that point of toxicity." There's much debate in the science community about nanoparticle toxicity, Anderson said. Some scientists believe that nanoparticles in nature will aggregate together or bind onto silt and/or other organic matter, greatly reducing their toxicity. "We don't know if that's true or not," she said. So other members of this Utah research group currently are investigating that aspect of the issue. Although the public is ultimately responsible for understanding the risks of consumer products, Gruden said, science plays a large role in highlighting possible hazards. "It is the scientist's job to perform good research and let the findings speak for themselves," she said. And so far the promises of nanotechnology need more evaluation. "To date, it's unclear whether the benefits of nanotech outweigh the risks associated with environmental release and exposure to nanoparticles." A magnetic charge can behave and interact just like an electric charge in some materials, according to new research led by the London Centre for Nanotechnology (LCN). The findings could lead to a reassessment of current magnetism theories, as well as significant technological advances. The research, published in Nature, proves the existence of atom-sized ‘magnetic charges’ that behave and interact just like more familiar electric charges. It also demonstrates a perfect symmetry between electricity and magnetism – a phenomenon dubbed ‘magnetricity’ by the authors from the LCN and the Science and Technology Facility Council’s ISIS Neutron and Muon Source. In order to prove experimentally the existence of magnetic current for the first time, the team mapped Onsager’s 1934 theory of the movement of ions in water onto magnetic currents in a material called spin ice. They then tested the theory by applying a magnetic field to a spin ice sample at a very low temperature and observing the process using muons at ISIS. The experiment allowed the team to detect magnetic charges in the spin ice (Dy2Ti2O7), to measure their currents, and to determine the elementary unit of the magnetic charge in the material. The monopoles they observed arise as disturbances of the magnetic state of the spin ice, and can exist only inside the material. 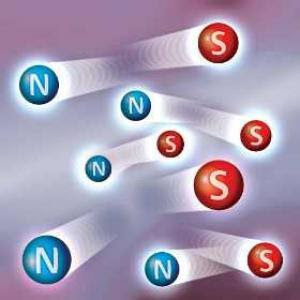 Professor Steve Bramwell, LCN co-author of the paper, said: “Magnetic monopoles were first predicted to exist in 1931, but despite many searches, they have never yet been observed as freely roaming elementary particles. These monopoles do at least exist within the spin ice sample, but not outside. a, In zero field, magnetic charges occur as bound pairs, but some dissociate to give a fluctuating magnetic moment (green arrow). 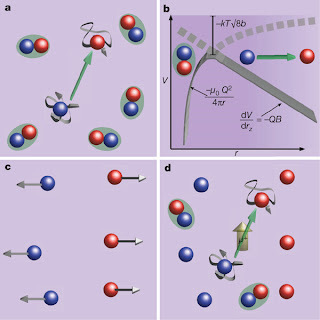 b, The field energy -QBrz competes with the Coulomb potential - 0Q2/4 r to lower the activation barrier to dissociation. c, The application of a transverse field causes dissociation as charges are accelerated by the field. d, In the applied field, these charges remain dissociated while more bound pairs form to restore equilibrium. Magnetic moment fluctuations due to free charges produce local fields that are detected by implanted muons ( +). The global annual fossil energy consumption corresponds to the energy received by 5.7 hours sunshine in deserts. This is about 0.15 % of annually incoming radiation. 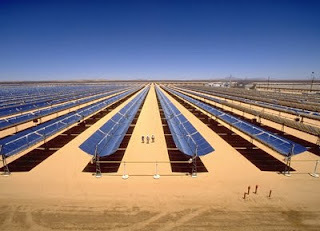 Solar power from deserts could supply electricity to 10 billion people in 2050. The technology exists to convert 15% of solar radiation into the useful energy form of electricity. This means, that 1% of the area of global deserts would be sufficient to produce the entire annual primary energy consumption of humankind as electric power. In other words: any conceivable global demand of energy, today or in future, could be produced from solar energy in deserts. 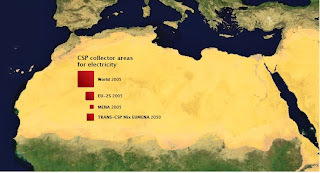 The DESERTEC Concept is an inter-continental project to supply sustainable electricity to Europe (EU), the Middle East (ME) and North Africa (NA) up to the year 2050. It shows that a transition to competitive, secure and compatible supply is possible using renewable energy sources and efficiency gains, and fossil fuels as backup for balancing power. The project will harness the sun’s power, supplying the energy needs of that region as well as transporting power from Africa to Europe along energy superhighways (high-efficiency high voltage direct current lines). Spain is already using solar thermal plants, and they have also been in use in the U.S. for more than 20 years. To this end red squares in the figure represent the accumulated areas for collectors typically needed to generate 17,000 TWh/y (terawatt hours per year) which is approximately the current world consumption, 3200 TWh/y (approx. EU-25 consumption), and 600 TWh/y (approx. Middle East/North Africa (MENA) consumption). The figure below shows Concentrating Solar Thermal Power Plants in the Mojave Desert. Until 2020, the market for solar thermal power plants will show annual double-digit growth rates and attain annual sales of over $28 billion (EUR20 billion). In the future, the primary focal growth regions will be the U.S., South Africa, Australia, Spain, India, North Africa and the Middle East. The developing and in particular the developed world depend crucially on the continuous supply of energy. The fossil fuel consumption in 2005 was 107,000 TWh/y. If desalination of sea water is powered by solar energy instead by fossil fuels, its environmental impacts are significantly reduced. However, seawater desalination itself is always a considerable burden to the environment, due to the resulting salty brine and the necessary chemical water treatment. Nano-filtration of intake water can mitigate those impacts, but more energy is required in that case. Therefore, activating the existing potential for enhanced efficiency of water use, water management and infrastructure is also a very high priority, in order to minimize the need for desalination. The European AQUA-CSP study analyzes the environmental impact of a broad application of solar-powered seawater desalination to cover the expected freshwater deficits. Siemens AG is acquiring the solar thermal power company Solel Solar Systems Ltd. to bolster its position in renewable power. Solel has a workforce of over 500 and is one of the world´s two leading suppliers of solar receivers, which are key components of so-called parabolic trough power plants. The high-growth company, which posted revenue totaling almost $90 million in the first six months of its current fiscal year (January 1 to June 30, 2009), is also a leader in the planning and construction of solar fields. The purchase price is about $418 million. Since 2006, Solel has also been present on the Spanish market, supplying key components for 15 solar thermal power plants with a combined capacity of 750 megawatts. In addition, the company is also active in the U.S. market. The transaction which much receive regulatory approval is expected to close before 2010.
carbon nanotubes are pure carbon, functionalized carbon nanotubes have other molecules attached somewhere along the tube's circumference, inside the nanotube, attached at the ends or in any number of combinations for an equally diverse number of applications. Depending on what molecules are added, the carbon nanotube will perform a variety of different functions such as delivering various drugs to specific cells in the body. They can also serve as additives to make stronger cement, polymer and epoxy composites with special properties. They can act as sensors for deadly chemicals or diseases. CNTs can serve as components of integrated circuits or photonic devices used in computers and fiber optic communication. It is estimated that more than 1000 types of functionalized carbon nanotubes have been developed. These newly designed molecules are patentable materials and big business. Functionalized carbon nanotubes command high prices. Functionalized CNT prices range for $1800 per kilogram to $80,000 per kilogram. Production of carbon nanotubes is expected to more than triple over the next five years. Sony Corp, Rice University and du Pont have all received recent patents for functionalized carbon nanotube, each serving a different purpose. Sony’s process does not involve complicated procedures such as using an atomic force microscope (AFM) or a high-temperature process such as chemical vapor deposition (CVD) but can position carbon nanotubes on predetermined electrodes with high accuracy. A chemical substance is used to cover the conductive material of the electrodes so that the connection between the functional groups at the ends of the carbon nanotubes and electrodes can be strengthened. William Marsh Rice University (Houston, TX) researchers reveal in a better way of integrating carbon nanotubes into epoxy polymer composites via chemical functionalization of carbon nanotubes as well as new carbon nanotube-epoxy polymer composites in U. S. Patent 7,601,421. Rice researchers Valery N. Khabashesku, Jiang Zhu, Haiqing Peng, Enrique V. Barrera and John L. Margrave maintain that integration is enhanced through improved dispersion and/or covalent bonding with the epoxy matrix during the curing process. In general, such methods involve the attachment of chemical moieties (i.e., functional groups) to the sidewall and/or end-cap of carbon nanotubes such that the chemical moieties react with either the epoxy precursor(s) or the curing agent(s) (or both) during the curing process. Additionally, the additional chemical moieties can function to facilitate dispersion of the carbon nanotubes by decreasing the van der Waals attractive forces between the nanotubes. Depending on their atomic structure CNT's have either metallic or semiconductor properties, and these properties, in combination with their small dimensions makes them particularly attractive for use in fabrication of nano-devices. A major obstacle to such efforts has been the diversity of tube diameters, chiral angles, and aggregation states in nanotube samples obtained from the various preparation methods. Aggregation is particularly problematic because the highly polarizable, smooth-sided fullerene tubes readily form parallel bundles or ropes with a large van der Waals binding energy. This bundling perturbs the electronic structure of the tubes, and it confounds all attempts to separate the tubes by size or type or to use them as individual macromolecular species. E.I. du Pont de Nemours and Company (Wilmington, DE) achieved good dispersion of carbon nanotubes by functionalizing them with nucleic acids. In United States Patent 7,588,941 reveals how du Pont inventors Ming Zheng and Bruce A. Diner using nucleic acid molecules in a stabilized solution of single stranded DNA and RNA were able to disperse a high concentration of bundled carbon nanotubes into an aqueous solution. They found that nucleic acids are very effective in dispersing the nanotubes, forming nanotube-nucleic acid complexes based on non-covalent interactions between the nanotube and the nucleic acid molecule. Once formed the dispersed nanotube-nucleic acid complexes containing ligands or binding pairs may be either immobilized on a solid substrate or rationally associated with other complexes in a process of nano-device fabrication. Preferred binding pairs for immobilization of the du Pont’s complexes are biotin/streptavidin or biotin/avidin. du Pont has also developed peptide-based carbon nanotube hair colorants and cosmetic compositions. Interuniversitair Microelektronica Centrum vzw (IMEC) (Leuven, BE) used functionalized carbon nanotubes to make photoelectrochemical cells. The functionalization of semiconductor surfaces is such that its semiconducting and light generating properties are maintained and the surface becomes stable in wet environments. U.S. Patent Application 2009021527 details unstable semiconductor materials which have photocurrent generating properties, and methods for the functionalization of surfaces with metallic carbon nanotubes (CNTs). The Carbon Trust launched a $12.6 million UK contest in early October 2009 to spur a breakthrough in fuel cell technology, which could open up a global fuel cell market worth over $180 billion by 2050, according to their analysis. The initiative aims to deliver the critical reduction in fuel cell system costs that must be achieved to make mass market deployment a reality. New Carbon Trust analysis shows that if substantial cuts can be achieved, the global market could be worth over $26bn in 2020 and over $180bn in 2050. The UK share of this market could be $1bn in 2020 rising to $19bn in 2050. By 2030, polymer fuel cells worldwide could be saving every year more CO2 than the UK will emit. Nanotechnology will be critical if fuel cells are to become mass market products, according to analysis in "FUEL CELLS, HYDROGEN ENERGY AND RELATED NANOTECHNOLOGY - A GLOBAL INDUSTRY AND MARKET ANALYSIS, published by iRAP, Inc. The fuel cell and hydrogen energy industry is highly fragmented. Worldwide, about 3,870 organizations were involved in fuel cells, hydrogen energy and related nanotechnology and spent an estimated $8.4 billion in 2008. More than 2,180 organizations are involved in nanotechnology related to fuel cells and hydrogen energy and will spend a total of $4.7 billion for fuel cells and hydrogen energy incorporating nanotechnology. Of that $4.7 billion, about $2 billion in 2008 expenditures, or 24% of the total spending, represents the value of nanotechnology for fuel cells and hydrogen energy separate from all other expenditures. The organizations are made up of well established corporations, start-up companies, universities, governments at the federal, state and municipal level, cooperative public/private demonstrations, as well as non-profit organizations and laboratories. Fuel cells and hydrogen energy is expected to reach a value of $8.8 billion in 2009 and $11.4 billion in 2014. About 56%, or 2,180 organizations are involved in nanotechnology related to fuel cells or hydrogen. Another 1,690 organizations (44%) are involved with fuel cells and hydrogen energy but no related nanotechnology. They are involved with valves, piping, power electronics, pumps, compressors, fans and other fuel cell system parts. The 24% for nanotechnology represents the value of nanotechnology for fuel cells and hydrogen energy, while 2,180, or 56% of the companies are involved in developing nanotechnology for fuel cells. Nanotechnology plays important roles is in all layers of a five layer fuel cell membrane electrode assembly (MEA). It is used as catalysts materials in both anodes and cathodes. Nanomaterials are also found in membranes, gas diffusion layers (GDL)s and even in the sealant material. Nano-platinum has allowed manufacturers to increase the electrical activity of the cells and increase their durability at lower costs. The figure illustrates where nanomaterials are used in a fuel cell MEA, which are stacked in increasing numbers depending on how much power is needed to be produced by the final product. The research holds two MEAs in front of a fuel cell stack. The figure also illustrates how fuel cells are parts intensive products. Bipolar plate---Directs the fuel to anode and cathode, respectively--Improves durability and corrosion resistance, extends life. The Carbon Trust “Polymer Fuel Cells Challenge” aims to accelerate the commercialization of breakthrough UK technology that could see the mainstream cost effective (mass) production of polymer fuel cell powered cars and buses, as well as providing electricity and heat in homes and business. These kinds of mass market applications could be saving the UK up to 7 million tons of CO2 a year in 2050, equivalent to taking two million of today’s cars off the road. Launching the initiative, Dr Robert Trezona, Head of Research and Development at the Carbon Trust, said: “Fuel cells have been ten years away from a real breakthrough for the past 20 years. This is a critical moment for UK fuel cell technology as emerging markets combine with technology cost breakthroughs to create a golden opportunity to launch world-beating products onto a massive global market. Our initiative aims to drive forward the commercialization of the UK’s unique fuel cell expertise which will play a crucial role in the UK’s Clean Tech Revolution both cutting carbon and creating jobs and economic value." Current fuel cell system costs are still too high by a factor of at least ten for widespread uses. These costs could be brought down in the future through volume production, but projections show that even then, with today’s technology, costs would remain too high by 30-40% for most markets. The Polymer Fuel Cells Challenge will aim to support those breakthroughs that will allow high-volume costs to come down by 35%, making fuel cell systems attractive for mass markets. The U.S. Department of Energy goal for fuel cells is a cost of $600 per kilowatt. Fuel cells efficiently convert the chemical energy contained in a fuel directly into electricity – they produce electricity like a battery but are fuelled like an engine or a boiler. Fuel cells are already marketed around the world, with sales growing at over 60% a year – they are used to power forklift trucks, mobile phone masts or provide power in camper vans. However, they currently remain too expensive to be more widespread. One application where fuel cells have proven to be more cost effective and technologically superiorj to lead acid batteries is in the $12 billion back-up power market. The fact is evidenced by PT. Hutchison CP Telecommunications (HCPT) recent selection of PT CONSISTEL Indonesia as its partner to deploy 200 units of Spiro hydrogen fuel cell in Java, Sumatra and Bali region of Indonesia. However not all is smooth sailing. Ballard Power Systems Inc. (TSX:BLD) said its joint venture with IdaTech LLC and Acme Group has hit a technical snag that will delay completing a contract for them to provide thousands of backup power systems for wireless networks in India. Ballard said the hydrogen system it developed for the project successfully passed product acceptance testing in July, but said the delay comes from the natural gas system provided by IdaTech. IdaTech informed Ballard that the system would likely miss the product acceptance testing deadline of Oct. 16. IdaTech can obtain a six-month extension on the testing deadline provided it is able to outline an acceptable plan by Nov. 16. Ballard said product volumes would be adjusted if the delay takes place. While disappointed by the delay, Atul Sabharwal, Chief Operating Officer, Acme Group said, "Acme …feels as strongly as ever that a substantial market opportunity exists for fuel cells in wireless telecom backup power and other applications in India, where reliable, cost-effective and environmentally-friendly solutions are greatly needed.” The company remains “excited about the potential for Ballard's low-cost, fuel cell stack." Carbon nanotube (CNT) heat sinks could soon be used in billions of new electronic devices annually. With the continually decreasing size of electronic and micromechanical devices, there is an increasing interest in materials that conduct heat efficiently, thus preventing structural damage. Carbon nanotube heat sinks could be used in wireless mobile phones, a personal digital assistants, pocket PCs, tablet PCs, notebook PCs, desktop computers, set-top boxes, audio/video controllers, DVD players, network routers, network switching devices, or servers. They could be used to cool: main memory, graphics processors, mass storage devices, and input/output modules. Examples of the memory include static random access memory (SRAM) and dynamic random access memory (DRAM). Examples of the mass storage devices include hard disk drives, flash drives, compact disk drives (CD), and digital versatile disk drives (DVD). Examples of the input/output modules include keyboards, cursor control devices, displays, network interfaces, and so forth. Under normal operation a microprocessor generates heat that must be removed to maintain the device temperature below a critical threshold and thereby maintain reliable operation. If a microprocessor overheats badly during operation it can be permanently damaged. Carbon nanotubes are one of the most thermally conductive materials that are manufactured today. Intel holds 107 U.S. Patents referencing carbon nanotubes (CNT). Among Intel’s many uses of carbon nanotubes in chip design is as a heat sink to protect microprocessors. Intel Corporation has developed a composite carbon nanotube structures for use as a thermal interface device in packaged integrated circuit devices that is manufactured on the chip. Intel has found the CNT heat sinks can wick away 20% more heat than conventional heat sink material. In U.S. Patent Application 20090224422, Intel inventor Valery M. Dubin reveals a composite CNT structures that provide high thermal conductivity, high mechanical strength, and good chemical stability. Further, these composite CNT structures may be fabricated to a very thin and uniform thickness. Also, the composite CNT structures may be fabricated using well known, low cost methods semiconductor manufacturing methods (e.g., CVD, PECVD, electroplating, electroless plating, sputtering, etc.). Their fabrication and use as thermal interface devices is compatible with existing assembly and process conditions. The composite carbon nanotube structure may be formed directly on a component, such as an integrated circuit die, a semiconductor wafer, a heat spreader, or a heat sink. In U.S. Patent 7,335,983, Intel discloses a semiconductor package that includes microchimneys or thermosiphons made of carbon nanotubes to improve the effective thermal conductivity of an integrated circuit die. A thermosiphon is an alternative structure for increasing die effective thermal conductivity. Thermosiphons typically exhibit heat transfer capabilities equivalent to solid materials with high thermal conductivity by taking advantage of a working fluid's latent heat of vaporization and condensation. Microchimneys and thermosiphons have related CNT structures and can be combined to wick heat more quickly from microdevices. Hon Hai Precision Ind. Co., Ltd. (Taipei Hsien, TW), also known as Foxconn, has also developed carbon nanotube heat sinks, which have high tensile strength, good flexibility and excellent heat conduction coefficients. This ensures good physical and thermal contact between the carbon nanotubes and an electronic device, and improves the heat conduction performance of the heat sink. Secondly, when the heat sink is used with the electronic device, other thermal interface materials such as thermal grease are not needed. Further, the carbon nanotubes have a low height. Therefore not only does the heat sink save on materials, it ensures that the combined electronic device and heat sink has reduced bulkiness and weight. Also the carbon nanotubes are perpendicular to and uniformly formed on the second surface of the semiconductor base, which ensures that the heat sink conducts heat directly and evenly. Finally the area of distribution of the carbon nanotubes can be varied according to need by controlling an area of distribution of the catalyst film. Nanoconduction Inc. (Menlo Park, CA) has created an “Integrated Circuit Micro-Cooler with the Tubes of a CNT Array.” The heat sink structures employ multi-layers of carbon nanotube or nanowire arrays to reduce the thermal interface resistance between an integrated circuit chip and the heat sink. The nanotubes are cut to essentially the same length over the surface of the structure. Carbon nanotube arrays are combined with a thermally conductive metal filler disposed between the nanotubes. This structure produces a thermal interface with high axial and lateral thermal conductivities. Lockheed Martin Corporation (Bethesda, MD) has developed carbon nanotube fibers that allow the fabrics to insulate, semi-conduct or super-conduct electrical charges. Additionally, the thermal properties of carbon nanotubes allow thermal energy to flow efficiently between the fabric and a heat sink or source. Additional yarns of materials other than carbon nanotubes can be integrated or woven into the fabric to provide other unique properties for the fabric. These fabrics can be layered to form unique garments or structures. Carbon nanotubes with differing characteristics can be woven together to create unique fabrics. For example, carbon nanotubes that serve to electrically insulate can be combined or layered with highly electrically conductive carbon nanotubes to create garments that shield and protect the wearer from electric shock. Similarly, thermally conductive carbon nanotubes can be woven into materials that when tethered to a heat sink or source, serve to protect a user from intense thermal environments. Others developing carbon nanotube heat sinks include: The Research Foundation of State University of New York, Sunrgi, Schlumberger-Doll Research, General Electric (GE), Samsung, and Tyco Electronics to name only a few. Nowadays, various alloys have been developed for special applications. Among these alloys, magnesium alloys have relatively superior mechanical properties, such as low density, good wear resistance, and high elastic modulus. However, the toughness and the strength of the magnesium alloys are not able to meet the increasing needs of the automotive and aerospace industry for tougher and stronger alloys. Tsinghua University scientists created a magnesium-based carbon nanotube composite material that is strong, tough, has a high density, and can be widely used in a variety of fields including the automotive and aerospace industries. In the magnesium-based composite material, nanoscale reinforcements (e.g. carbon nanotubes and carbon nanofibers) are mixed with the magnesium metal or alloy. The most common methods for making the magnesium-based composite material have been thixomolding and die-casting. However, in die-casting, the magnesium or magnesium alloy is easily oxidized. In thixomolding, the nanoscale reinforcements are added to melted metal or alloy but are prone to aggregate. As such, the nanoscale reinforcements can't be well dispersed. Tsinghua researchers Kam-Shau Chan, Cheng-Shi Chen, Guang-Liang Sheu, Qing-Chun Du And Wen-Zhen Li developed an apparatus for fabricating a magnesium-based carbon nanotube composite material, in which the problems of aggregation and settling are eliminated or at least alleviated. Tsinghua University’s method includes the steps of: (a) providing a magnesium-based melt and carbon nanotubes, mixing the carbon nanotubes with the magnesium-based melt to achieve a mixture; (b) injecting the mixture into at least one mold to achieve a preform; and (c) extruding the preform to achieve the magnesium-based carbon nanotube composite material. The mixing device includes a container with a protective gas therein, a stirrer disposed in a center of the container, and a heater (e.g. hot wires) disposed on a outer wall of the container. Quite suitably, the protective gas can, beneficially, be made up of at least one of nitrogen, ammonia, and a noble gas. The heater heats the container to a predetermined temperature in the approximate range from 550 degree C. to 750 degree C. Carbon nanotubes are in the approximate range from 1% to 5% by weight in the alloy. The materials is extruded into performs where it cools quickly enough to prevent settling and aggregation of the carbon nanotubes. In the extrusion step, the preforms experience a deformation process when extruded from the exit. In the deformation process, different parts of the preforms will be mixed together. The carbon nanotubes are redistributed in the preforms which enhances dispersion uniformity of the carbon nanotubes in the magnesium-based carbon nanotube composite material. The mixing apparatus is detailed in U.S. Patent Application 20090127743. It is one of 47 applications concerning carbon nanotubes filed by Tsinghua University which is among China's leaders in nanotechnology research and development. The University already hold 20 U.S. Patents related to nanotechnology.